This time, I just wanted to share a little about the process of going through one task in TFS from the very beginning until the task was pegged â€œdoneâ€ â€“ all using BDD and TDD, of course â€“ there is no other way! Since I am the only developer on this project, and also project owner, the project architect, and project code monkey, my scrum board tends to look like the teeth of a shark. My backlog is wafer-thin, and the user stories often come about AFTER the tasks have been described. Normally, you would have a well-defined backlog of user stories and for each sprint, a set of tasks for every user story planned. The tag performsIO needs some explanation: What it does is basically tell SpecFlow to use a runtime configuration prior to running this scenario. I use Structuremap as my IoC container to keep things simple. where all the IO performing classes are replaced with mocks. 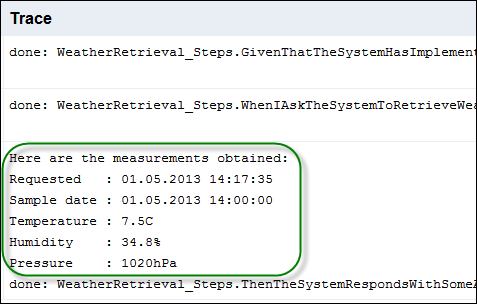 Lastly, the inspection step simply verifies that the values of the weathermeasurement look ok.
BDD has now driven forth the need for an IWeatherCollector with the method GetWeather(GpsLocation). Additionally, it also specifies that it the collector needs to return some form of WeatherMeasurement class. As you can tell, I am using Roy Osheroveâ€™s naming system for my unit tests. Since I see these as micro-specifications, I just love the way these work as fine-grained API documentation for the method I just described. Unfortunately, Visual Studio does not show me the tests in document-order! Reading the unit-tests in document-order is, in my view, the best way to understand a method. 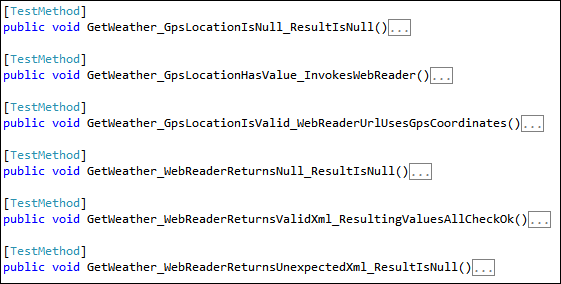 Why: The WeatherCollector class is no more than a service class that requests some xml from an external source and then translates that xml into a WeatherMeasurement object. The single responsability of the collector, is simply to combine the result of a reader and pass it along to the proper converter if all looks ok. This could possibly lead to using the name WeatherRepository instead, however, Collector was a term I felt more at ease with. Readability > patterns! I wonâ€™t bother you with the details, but the implementations of the WebReader and Converter followed the same TDD approach â€“ one after the other. Geen tests lead to green story! General approach: Once youâ€™re done with all the unit-tests for a method, you should run the user story to see if you have forgotten anything else. In my case, I only had one scenario, but I found out twice that I had to implement WebReader and then IConverter<XElement, WebMeasurement>. If you forget one, the SpecFlow report shines in red, telling you that sometihng is not yet implemented. â€“ Do you still wonder why I love BDD? Implement the scenario steps and drive forth the interfaces, their methods and objects required by the task. One scenario at the time! Do not implement classes yet, just let the interfaces sit until youâ€™re done writing the scenarios. Discover additional objects and contracts, but do not implement them before youâ€™re done with the method youâ€™re working on. Writing this blog post took me far longer than actually doing the steps above. Without the blog post, I wouldâ€™ve been done within the hour. Don’t forget to add something about how much water to actually pour onto the plants. Should the water be distributed evenly? Should the amount of distributed water be measured, to avoid drowning the plants before the sensor screams stop?